Poland elects right-wing Law and Justice party. 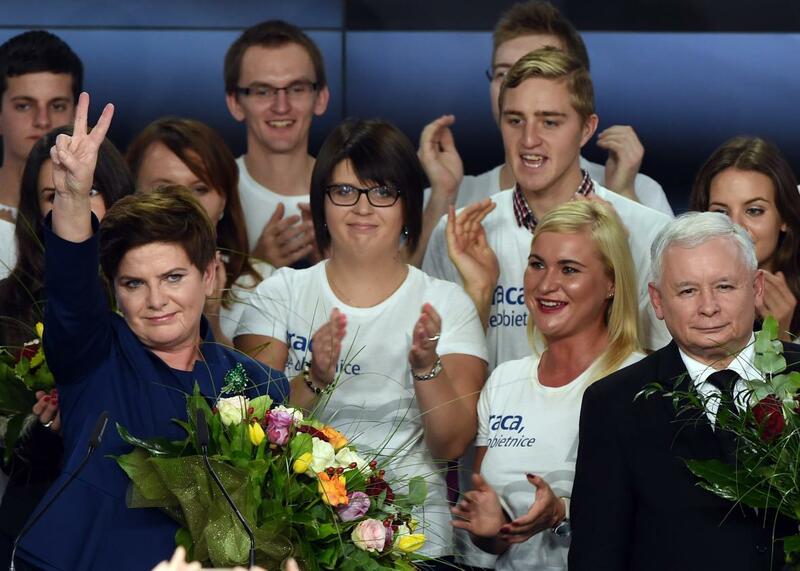 Jaroslaw Kaczynski leader of the conservative opposition Law and Justice party and like new prime minister Beata Szydlo celebrate with supporters at the party’s headquarters in Warsaw after exit poll results were announced on October 25, 2015. The nationalist, euroskeptic Law and Justice party has upended politics in Poland, winning an election on Sunday that could have serious implications for the rest of the European Union. Final results won’t be released until Tuesday, but early exit polls suggest Law and Justice won around 39 percent of the vote, trouncing Prime Minister Ewa Kopacz’s center-right Civic Platform, which came in second with 23.4 percent. 52-year old party veteran Beata Szydlo will be the new prime minister. Longtime party leader Jaroslaw Kaczynski, who was prime minister from 2006-2007 is expected to exercise substantial power behind the scenes. The election, which follows Law and Justice candidate Andrzej Duda’s victory in the presidential election in May, cements Poland’s lurch to the right. Not a single left-wing party appears to have passed the 8 percent threshold needed to enter parliament, the first time this has happened since the country’s communist government was ousted in 1989. Another big winner of last night was the right-wing, populist former punk rocker Pawel Kukiz, whose Kukiz ’15 party won around 9 percent of the vote and could potentially form an alliance with Law and Justice. While Poland has one of the fastest growing economies in Europe and is well-off compared to its ex-Communist neighbors, prosperity is still coming far too slowly for many Poles. Law and Justice is usually described as right-wing, but its economic platform is anything but: It supports a higher minimum wage, more taxes on corporations, and raising the retirement age. The party appeals to conservative Catholic voters on issues like abortion—Poland is the only country in Europe where abortion is illegal in most cases. But unlike some of the other right-wing populist parties that have risen to prominence in recent years, it is deeply critical of Russia (many Poles believe Russia may have had a hand in the plane crash that killed former president Lech Kaczynski, Jaroslaw’s twin brother, along with his wife and many of the party’s senior officials) and will likely call on NATO to take a stronger role in countering Russia’s encroachment into Eastern Europe. That doesn’t mean the party is that fond of the EU, which it sees as dominated by Germany. Poland is unlikely to join the Eurozone under the party’s rule and will probably clash with Brussels on issues like carbon emission reduction targets, which it wants to be voluntary and non-binding. But the biggest clash is likely to come over Europe’s refugee crisis, which played a major role in the campaign. Along with the EU’s other newer eastern members, Kopacz’s government opposed mandatory quotas on taking in refugees, but under EU pressure agreed to take 5,000 of the 120,000 people the EU wants to spread out through the 28-member bloc. Law and Justice accused the government of capitulating to Germany, and Jaroslaw Kaczynski suggested that migrants could bring diseases into Europe. (He’s also expressed admiration for Hungary’s hard-line anti-immigrant President Viktor Orban, though the two differ sharply when it comes to Vladimir Putin.) Law and Justice’s potential new partner Kukiz has said that most of the people coming into Europe are ” economic migrants,” not refugees. Law and Justice seems likely to moderate some of its stances now that it’s in power. It is putting forward younger more conciliatory leaders like Szydlo and Duda over the more combative Kaczynski, who will remain in the background. And despite its differences with Brussels, the party is very unlikely to pull Poland out of the European Union. Still, after months of fractious debates over the Greek bailout and refugee crisis, and with Britain’s in-out referendum on EU membership looming next year, Poland’s new direction is not a great sign for the European project.